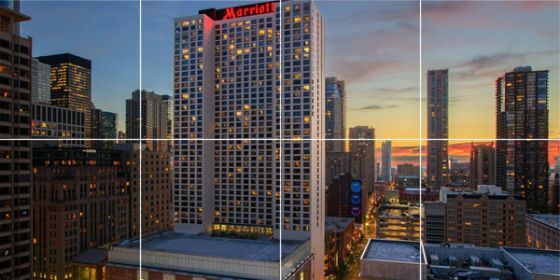 G/BA provided engineering design and construction administration services for replacement of hot water boilers in this 1,200-room luxury hotel in downtown Chicago. Peoples Gas, the local gas utility, provided $37,000 in incentives. The project also received a $9,000 Energy Efficiency Program incentive from ComEd, the local electrical utility. rooms and suites; 68,000 square feet of event space; and a 9,000-square-foot fitness center. Demolition and replacement of three hot water boilers with 14 modular boilers. The modular boilers offer a small footprint and an increased efficiency over previous boilers (approximately 85% efficiency vs. 75%). Conversion of the hot water distribution system to variable flow, with constant-speed primary boiler pumps and variable-speed secondary distribution pumps. Replacement of secondary hot water pumps and provision of variable frequency drives. Connection and extension of hot water piping. Upgrades to heating plant building automation system (BAS) controls. Phased installation of hot water boilers, which also provide domestic hot water for the hotel, to ensure continuous availability of hot water in the guest rooms. Metering and tracking of natural gas consumption and hot water use by zone. Modifications to the ventilation system that provides combustion air to the equipment room. Replacement and upgrades of power connections to the mechanical equipment. New electrical distribution equipment, transformers, and lighting layout.